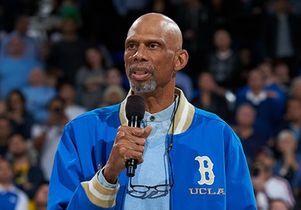 Kareem Abdul-Jabbar, a legendary Bruin whose renown as an author, historian and advocate for social justice has extended well beyond his athletic career, took center court at Pauley Pavilion one more time Saturday to receive the cheers and applause of basketball fans attending the Bruins’ game against the University of Arizona. 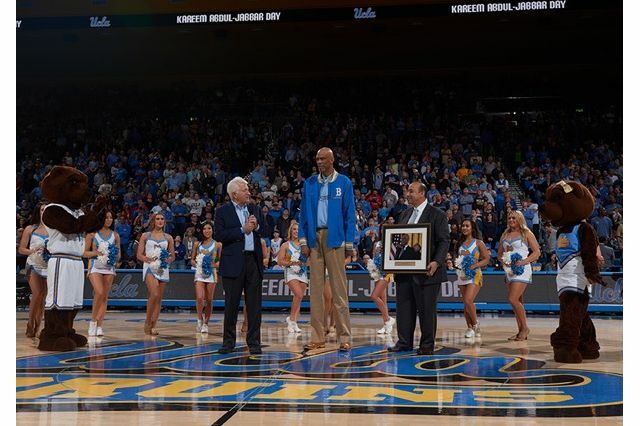 The celebration of Kareem Abdul-Jabbar Day at UCLA followed the Nov. 22 presentation of the nation’s highest civilian honor — the Presidential Medal of Freedom — by outgoing President Obama to the towering Bruin icon. Further illustrating the former basketball star’s far-flung interests, on Jan. 17, Obama appointed Abdul-Jabbar to the President’s Council on Fitness, Sports and Nutrition. Two days later, the United States Mint announced his appointment to a national citizens’ committee that advises the Secretary of the Treasury on circulating and commemorative coins. An avid coin collector, Abdul-Jabbar became interested in numismatics through his love of history and his study of Alexander Hamilton. At the center court ceremony on Jan. 21, Chancellor Gene Block also paid tribute to Abdul-Jabbar’s wide-ranging contributions to the nation. 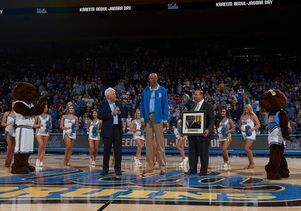 “You’ve seen, and you know, about his legendary athletic accomplishments,” Block said to the crowd at Pauley Pavilion, “but those are really just a warmup. What he has accomplished since is extraordinary. He’s been a strong supporter of human rights, civil rights and social justice.” An accomplished historian and eight-time New York Times best-selling author, Abdul-Jabbar also served as a cultural ambassador representing the United States. “Much of what he’s accomplished, he’s accomplished not for himself, but for us, to make us a better nation, to make us a better people,” Block said before Abdul-Jabbar was presented with a framed photo of the moment when the president gave him the Medal of Freedom. 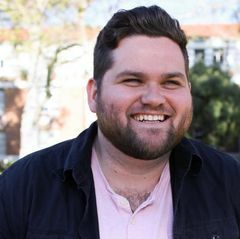 “I want to thank all the people who were involved in the academic part of my stay here, because that’s what’s given me what I have today,” he said. 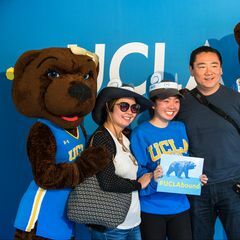 "I want to tell all you Bruins, all the students and the staff: Keep up the good work. We make a difference in the world. Don't ever stop doing that."